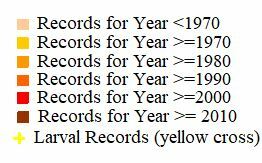 Notes: Very rare immigrant (less than 10 previous UK records) from southern Europe, appearing in Britain once, at Stackpole, Pembrokeshire, in July 1982. Not recorded in Hampshire or on the Isle of Wight to date. Wingspan 31-36 mm. Larva feeds on withered leaves, no evidence of breeding in the UK.